Like reading Communities of Practice, this work is a foray into new perspectives for me – always interesting and usually completely disruptive to my current, constructed understanding of the world. I have read bits and pieces (and reflected here and Discourses here), but I wanted to read the entire compilation this summer. This reflection is after reading the first three chapters. 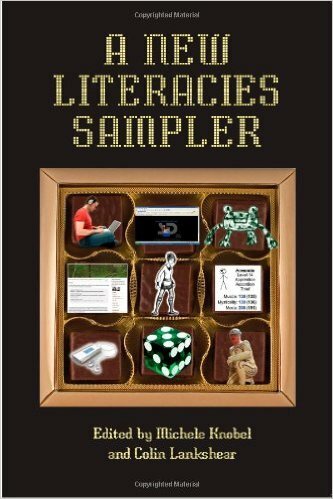 The works in this book are firmly in the constructivist paradigm and use a sociocultural perspective on literacy. This latter parts means that “reading and writing can only be understood in the contexts of social, cultural, political, economic, historical practices to which they are integral, of which they are a part.” (p.1) Understanding literacies in this way is the foundation of calling them “new.” It is more than just reading and writing (i.e. encoding and decoding print), but it is the “relationship between human practice and the production, distribution, exchange, refinement, negotiation and contestation of meanings.” (p.2) It is seeing the acts of reading and writing encompass norms, attitudes, values, meaning-making – all of which are as social practices. There are two distinctions of what something has when it is part of the “new” literacies: new “technical stuff” and new “ethos stuff.” “The new technical stuff has mainly to do with how it enables people to build and participate in literacy practices that involve different kinds of values, sensibilities, norms and procedures,” (p.7) and new ethos stuff is more participatory, collaborative, distributed, or fluid, and it is less expert-dominated. (p.9) Examples of this might include fantasy baseball, wikipedia, fan fiction, etc. 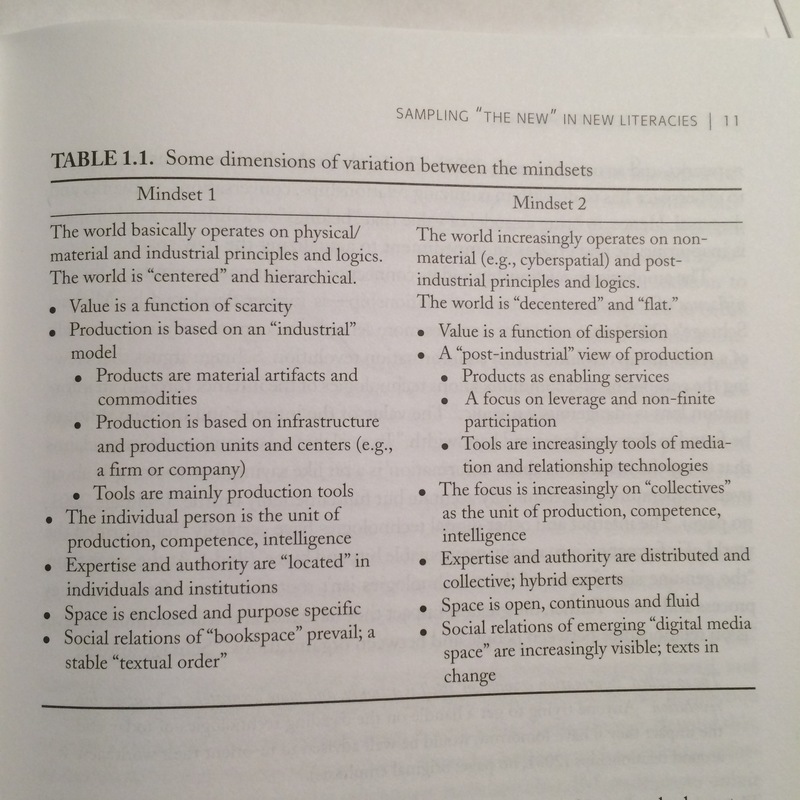 Knobel and Lankshear in chapter one also describe space itself as different: “cyberspace [is] a distinctively new space that co-exists with physical space.” (p.9) This has implications for the physical-industrial world, though, and this means a change in mindset for the cyberspatial-postindustrial world. How do these different mindsets play out? What happens in schools when teachers are operating under mindset 1 but students are in 2? How do we value such practices, such as those considered “academic” and “non-academic?” I can think of several students (mostly boys) who were phenomenal machinima or music remix creators, and I thought this was cool/worthy/interesting/skillful, but still considered it external to the core social, emotional, and academic mission of the school I was teaching at. (Yet ironically it was easy to see complementary learning in their extra-curricular sports participation.) Ignoring their participation in those spaces is akin to ignoring them, not caring about them… sounds an awful lot like the mechanization of education that Audrey Watters, blogger and tech historian/storyteller, talked about yesterday. One thing I have enjoyed about reading this so far is that the research feels very grounded in what I’ve experienced in schools and has really made me question my own actions and assumptions. I find myself thinking, “Wait, but, why can’t a teacher choose to have students close their laptops? What’s wrong with asking students to handwrite an essay? Students shouldn’t be playing games during class. Of course that’s off-task behavior.” And so on. It makes me question the very premises of what teachers and schools do and the foundational schisms between how schools operate and how non-school operates. Audrey Watters unapologetically attacks the capitalist, consumerist culture as promoted by Silicon Valley. Likewise, this past fall I read Richard Sennett’s The Culture of the New Capitalism (wrote about it here), which was equally critical of this new world order. I guess I feel a bit caught – schools are doing “it” wrong, but the tech companies (that provide the platforms where kids are outside of schools – i.e. instagram, video games) are doing it wrong too. Where are things going right? (What does that even mean?) What is the role of adults in guiding kids through a world that is so fundamentally different between us and them? There is maybe not an answer, but perhaps a glimmer of hope, in the existence of participatory cultures and affinity spaces, where these new literacies are played out as kids and adults explore, produce, and learn in a way that is meaningful and valuable to them and their community. This “learning in the wild” might be where the good stuff is going on, with the new literacies as the perspective to help us understand it.